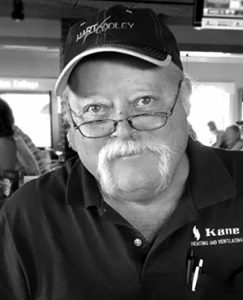 Joe Neal Hubbard, 61, passed February 3, 2019 at home with his family close to him. He was born in Lansing on January 17, 1958, to Eileen May (Smith) and Jack Earl Hubbard. Joe had many jobs around the area over the years, working for Fisher Body, the Clark gas station, and then Kane Heating and Cooling for the last 30 years, with Joe and Kathleen buying the company in 1999. Joe always made time for family, including every day he would have lunch at noon with his wife at The Eaton Place. Joe had many things to keep him busy, he loved riding his Harley, going camping in the U.P. and yearly camping trips with Ted. He also enjoyed Monday night pool league, and monthly birthday parties for family members. Joe loved beating Kathy at Cribbage, they always had an ongoing tournament. Joe gave up golf when his brother-in-law and friend, John Vlahakis, passed in 2015. He also loved a challenge when a Kane customer needed something custom made out of sheet metal. Joe is survived by his loving wife of 31 years, Kathleen; five daughters, Jennifer Robles (Chris Tossava), Jesica Hubbard, Michelle Henry, Antonia (Joseph) Challender, and Jennifer Lynn (Joey Green) Squier; grandchildren, Cody, Kayla, Mason, Rose, Grace, Katie, Austin, DeVante, Britany, Alexis, Rachel, Athena, Adara, J.D. (Joseph Donald), Chrisitian, Trevor Joe-Jack, Emalynn, and Elijah; six great-grandkids; mother and step-dad, Eileen and Bennie Pittman; step-mother, Sharon Hubbard; siblings, Shannon, Shawn (Michelle), Jerry, Antonette, Jack Wayne, Teresa, Lynda (Mike), Betty, and Julie (Jerry); many specials aunts, uncles, nieces and nephews, cousins; best friend, Ted; friend and business partner, Chad Lewis Jr.; and many, many more. Joe was preceded in death by his father, Jack Earl Hubbard; and sister, Mary. Special thank you to Michelle Hubbard for her special care and devotion when Joe needed her, he adored her and was calmer when she was there, and brother, Shawn Hubbard, for his love and support. Friends are encouraged to support Joe’s family at visitation and funeral services. Funeral services are Monday, February 11, 2019, at 1 p.m. at Pray Funeral Home in Charlotte, with Pastor Charles Jenson officiating. Visitation is Sunday, February 10, from 1 to 3 p.m. and 5 to 7 p.m. at the funeral home, as well as two hours prior to the services, from 11 a.m. to 1 p.m. on Monday, February 11. If desired, the family suggests memorial contributions to Eaton County Humane Society. Friends and family are encouraged to share memories of Joe on his tribute page at PrayFuneral.com.